I got my Sonntag J18H Augusta in 2005, and she has been my favourite since, especially in big band situations. I used to be a monolithic Gibson man, but has converted more or less to Sonntag. I have attended the Master class in Provence several years, and find it very fulfilling when it comes to trying out those wooden boxes, and playing extensively. School band horn was my first music experience, and later I started out playing a norwegian made flat top guitar at the age of 15. Self taught, mostly through looking up those three pages of guitar chord diagrams in a music encyclopedia. Jazz was the order of the day, Miles Davis’small bands, Art Blakey and the Gerry Mulligan quartet being the first impressions. Played in a local big band, and met up with fellow guitarist Terje Rypdal who incidentally joined a guitar course arranged by the band. Decided to form a Shadows-type rock band (“The Vanguards”) with Terje, and was thus hi-jacked from jazz into a career as pop-rock guitarist for four years. Decided enough is enough in 1964, and jumped off the band wagon and into engineering studies. Guitar playing has been a hobby since. Joined Sandvika big band in 1971. Went off to university studies in Edinburgh 1973-1976, and heard by coincidence a BBC broadcast with irish guitarist Louis Stewart. Met Louis on a gig in Tromsø in 1978, and has been close with Louis and his family since. Founded a record company “Villa Records AS” in 1986, and enjoyed a five star “Excellent” rewiev in Down Beat for the first record with Louis. 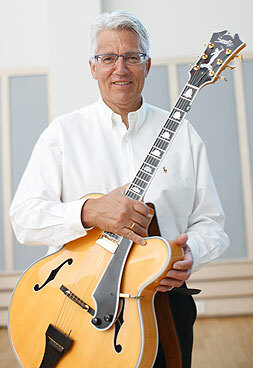 Has released several jazz guitar records since, and also contributed on records with “the Vanguards”, Sandvika big band and own groups. Played with many visiting US and european jazz musicians , a.o. Bob Brokmeyer, Art Farmer, Peter Herbolzheimer, the Real Group, Bill Watrous and Len McCarthy. Current duo with pianist Håvard Graff. Played mostly rhythm guitar for many years, and only hand a handful hours of tuition to get rid of the most incorrect ways to handle a guitar. Started to get more serious about soloing later. Still find rhythm playing a great challenge, and worth total dedication.